D. Huang, E. A. Swanson, C. P. Lin, J. S. Schuman, W. G. Stinson, W. Chang, M. R. Hee, T. Flotte, K. Gregory, C. A. Puliafito, and J. G. Fujimoto, “Optical coherence tomography,” Science 254, 1178 (1991). C. A. Puliafito, M. R. Hee, C. P. Lin, E. Reichel, J. S. Schuman, J. S. Duker, J. A. Izatt, E. A. Swanson, and J. G. Fujimoto, “Imaging of Macular Diseases with Optical Coherence Tomography,” Ophthalmology 102(2), 217–229 (1995). M. R. Hee, C. A. Puliafito, C. Wong, J. S. Duker, E. Reichel, J. S. Schuman, E. A. Swanson, and J. G. Fujimoto, “Optical Coherence Tomography of Macular Holes,” Ophthalmology 102(5), 748–756 (1995). M. R. Hee, C. A. Puliafito, C. Wong, J. S. Duker, E. Reichel, B. Rutledge, J. S. Schuman, E. A. Swanson, and J. G. Fujimoto, “Quantitative assessment of macular edema with optical coherence tomography,” Arch. Ophthalmol. 113(8), 1019–1029 (1995). M. R. Hee, C. R. Baumal, C. A. Puliafito, J. S. Duker, E. Reichel, J. R. Wilkins, J. G. Coker, J. S. Schuman, E. A. Swanson, and J. G. Fujimoto, “Optical Coherence Tomography of Age-related Macular Degeneration and Choroidal Neovascularization,” Ophthalmology 103(8), 1260–1270 (1996). S. Radhakrishnan, A. M. Rollins, J. E. Roth, S. Yazdanfar, V. Westphal, D. S. Bardenstein, and J. A. Izatt, “Real-time optical coherence tomography of the anterior segment at 1310 nm,” Arch. Ophthalmol. 119(8), 1179–1185 (2001). R. P. McNabb, S. Farsiu, S. S. Stinnett, J. A. Izatt, and A. N. Kuo, “Optical Coherence Tomography Accurately Measures Corneal Power Change from Laser Refractive Surgery,” Ophthalmology 122(4), 677–686 (2015). O. Carrasco-Zevallos, D. Nankivil, B. Keller, C. Viehland, B. J. Lujan, and J. A. Izatt, “Pupil tracking optical coherence tomography for precise control of pupil entry position,” Biomed. Opt. Express 6(9), 3405–3419 (2015). S. A. Boppart, B. E. Bouma, C. Pitris, G. J. Tearney, J. G. Fujimoto, and M. E. Brezinski, “Forward-imaging instruments for optical coherence tomography,” Opt. Lett. 22(21), 1618–1620 (1997). P. N. Dayani, R. Maldonado, S. Farsiu, and C. A. Toth, “Intraoperative use of handheld spectral domain optical coherence tomography imaging in macular surgery,” Retina 29(10), 1457–1468 (2009). P. B. Knecht, C. Kaufmann, M. N. Menke, S. L. Watson, and M. M. Bosch, “Use of Intraoperative Fourier-Domain Anterior Segment Optical Coherence Tomography During Descemet Stripping Endothelial Keratoplasty,” Am. J. Ophthalmol. 150(3), 360–365 (2010). R. S. Maldonado, R. V. O’Connell, N. Sarin, S. F. Freedman, D. K. Wallace, C. M. Cotten, K. P. Winter, S. Stinnett, S. J. Chiu, J. A. Izatt, S. Farsiu, and C. A. Toth, “Dynamics of Human Foveal Development after Premature Birth,” Ophthalmology 118(12), 2315–2325 (2011). F. LaRocca, D. Nankivil, S. Farsiu, and J. A. Izatt, “Handheld simultaneous scanning laser ophthalmoscopy and optical coherence tomography system,” Biomed. Opt. Express 4(11), 2307–2321 (2013). D. Nankivil, G. Waterman, F. LaRocca, B. Keller, A. N. Kuo, and J. 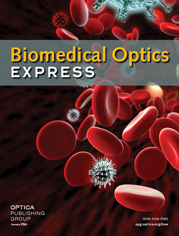 A. Izatt, “Handheld, rapidly switchable, anterior/posterior segment swept source optical coherence tomography probe,” Biomed. Opt. Express 6(11), 4516–4528 (2015). G. Geerling, M. Müller, C. Winter, H. Hoerauf, S. Oelckers, H. Laqua, and R. Birngruber, “Intraoperative 2-dimensional optical coherence tomography as a new tool for anterior segment surgery,” Arch. Ophthalmol. 123(2), 253–257 (2005). L. B. Lee and S. K. Srivastava, “Intraoperative spectral-domain optical coherence tomography during complex retinal detachment repair,” Ophthalmic Surg. Lasers Imaging 42, e71–e74 (2011). L. De Benito-Llopis, J. S. Mehta, R. I. Angunawela, M. Ang, and D. T. H. Tan, “Intraoperative Anterior Segment Optical Coherence Tomography: A Novel Assessment Tool during Deep Anterior Lamellar Keratoplasty,” Am. J. Ophthalmol. 157(2), 334–341 (2014). J. P. Ehlers, J. Goshe, W. J. Dupps, P. K. Kaiser, R. P. Singh, R. Gans, J. Eisengart, and S. K. Srivastava, “Determination of feasibility and utility of microscope-integrated optical coherence tomography during ophthalmic surgery: the DISCOVER Study RESCAN Results,” JAMA Ophthalmol. 133(10), 1124–1132 (2015). J. Migacz, O. Carrasco-Zevallos, P. Hahn, A. Kuo, C. Toth, and J. Izatt, “Intraoperative Retinal Optical Coherence Tomography,” in Optical Coherence Tomography, W. Drexler and J. G. Fujimoto, eds. (Springer International Publishing, 2015), pp. 1771–1796. O. Carrasco-Zevallos, B. Keller, C. Viehland, L. Shen, G. Waterman, B. Todorich, C. Shieh, P. Hahn, S. Farsiu, A. N. Kuo, C. A. Toth, and J. A. Izatt, “Live volumetric (4D) visualization and guidance of in vivo human ophthalmic microsurgery with intra-operative optical coherence tomography,” (Submitted). O. Carrasco-Zevallos, B. Keller, C. Viehland, L. Shen, G. Waterman, C. Chukwurah, P. Hahn, A. N. Kuo, C. A. Toth, and J. A. Izatt, “Real-time 4D Stereoscopic Visualization of Human Ophthalmic Surgery with Swept-Source Microscope Integrated Optical Coherence Tomography,” Invest. Ophthalmol. Vis. Sci. 56, 4085 (2015). P. Hahn, O. Carrasco-Zevallos, D. Cunefare, J. Migacz, S. Farsiu, J. A. Izatt, and C. A. Toth, “Intrasurgical Human Retinal Imaging With Manual Instrument Tracking Using a Microscope-Integrated Spectral-Domain Optical Coherence Tomography Device,” Transl. Vis. Sci. Technol. 4(4), 1 (2015). N. D. Pasricha, C. Shieh, O. M. Carrasco-Zevallos, B. Keller, J. A. Izatt, C. A. Toth, and A. N. Kuo, “Real-Time Microscope-Integrated OCT to Improve Visualization in DSAEK for Advanced Bullous Keratopathy,” Cornea 34(12), 1606–1610 (2015). S. Binder, C. I. Falkner-Radler, C. Hauger, H. Matz, and C. Glittenberg, “Feasibility of intrasurgical spectral-domain optical coherence tomography,” Retina 31(7), 1332–1336 (2011). P. Steven, C. Le Blanc, K. Velten, E. Lankenau, M. Krug, S. Oelckers, L. M. Heindl, U. Gehlsen, G. Hüttmann, and C. Cursiefen, “Optimizing descemet membrane endothelial keratoplasty using intraoperative optical coherence tomography,” JAMA Ophthalmol. 131(9), 1135–1142 (2013). S. Siebelmann, P. Steven, D. Hos, G. Hüttmann, E. Lankenau, B. Bachmann, and C. Cursiefen, “Advantages of microscope-integrated intraoperative online optical coherence tomography: usage in Boston keratoprosthesis type I surgery,” J. Biomed. Opt. 21(1), 016005 (2016). J. P. Ehlers, P. K. Kaiser, and S. K. Srivastava, “Intraoperative optical coherence tomography using the RESCAN 700: preliminary results from the DISCOVER study,” Br. J. Ophthalmol. 98(10), 1329–1332 (2014). Y. K. Tao, S. K. Srivastava, and J. P. Ehlers, “Microscope-integrated intraoperative OCT with electrically tunable focus and heads-up display for imaging of ophthalmic surgical maneuvers,” Biomed. Opt. Express 5(6), 1877–1885 (2014). J. P. Ehlers, S. K. Srivastava, D. Feiler, A. I. Noonan, A. M. Rollins, and Y. K. Tao, “Integrative advances for OCT-guided ophthalmic surgery and intraoperative OCT: microscope integration, surgical instrumentation, and heads-up display surgeon feedback,” PLoS One 9(8), e105224 (2014). K. Kihara, Y. Fujii, H. Masuda, K. Saito, F. Koga, Y. Matsuoka, N. Numao, and K. Kojima, “New three-dimensional head-mounted display system, TMDU-S-3D system, for minimally invasive surgery application: procedures for gasless single-port radical nephrectomy,” Int. J. Urol. 19, 886–890 (2012). M. D. Heath and A. A. Cohen-Gadol, “Intraoperative stereoscopic 3D video imaging: pushing the boundaries of surgical visualisation and applications for neurosurgical education,” Br. J. Neurosurg. 26(5), 662–667 (2012). C. Eckardt and E. B. Paulo, “Heads-up surgery for vitreoretinal procedures: an experimental and clinical study,” Retina 36(1), 137–147 (2016). C. Wheatstone, “Contributions to the physiology of vision.–Part the first. On some remarkable, and hitherto unobserved, phenomena of binocular vision,” Philos. Trans. R. Soc. Lond. 128(0), 371–394 (1838). C. E. Rash, M. B. Russo, T. R. Letowski, and E. T. Schmeisser, “Helmet-mounted displays: Sensation, perception and cognition issues,” (DTIC Document, 2009). N. S. Holliman, N. A. Dodgson, G. E. Favalora, and L. Pockett, “Three-dimensional displays: a review and applications analysis,” IEEE Trans. on Broadcasting 57(2), 362–371 (2011). J. A. Trias, “Real-time high-resolution 3-D large-screen display using laser-activated liquid crystal light valves,” (Google Patents, 1986). M. Gross, S. Würmlin, M. Naef, E. Lamboray, C. Spagno, A. Kunz, E. Koller-Meier, T. Svoboda, L. V. Gool, S. Lang, K. Strehlke, A. V. Moere, and O. Staadt, “blue-c: a spatially immersive display and 3D video portal for telepresence,” in ACM SIGGRAPH 2003 Papers, (ACM, San Diego, California, 2003), pp. 819–827. D. B. Corbin, “Stereo head mounted display using a single display device,” (Google Patents, 2001). O. Carrasco-Zevallos, B. Keller, C. Viehland, P. Hahn, A. N. Kuo, P. J. DeSouza, C. A. Toth, and J. A. Izatt, “Real-time 4D visualization of surgical maneuvers with 100kHz swept-source Microscope Integrated Optical Coherence Tomography (MIOCT) in model eyes,” Invest. Ophthalmol. Vis. Sci. 55, 1633 (2014). C. Viehland, B. Keller, O. M. Carrasco-Zevallos, D. Nankivil, L. Shen, S. Mangalesh, D. T. Viet, A. N. Kuo, C. A. Toth, and J. A. Izatt, “Enhanced volumetric visualization for real time 4D intraoperative ophthalmic swept-source OCT,” Biomed. Opt. Express (Submitted to). P. Didyk, T. Ritschel, E. Eisemann, K. Myszkowski, and H.-P. Seidel, “A perceptual model for disparity,” in ACM Transactions on Graphics (TOG), (ACM, 2011), 96. Y. S. Modi and J. P. Ehlers, “Heads-up Vitreoretinal Surgery: Emerging Technology in Surgical Visualization,” Retinal Physician 13, 26–29 (2016). Fig. 1 (A) Optical design of novel microscope-integrated HUD system mounted on a surgical microscope. (B) Illustration of images seen through oculars. The black circles represent the microscope ocular FOVs. The red squares represent the micro-display image relayed to viewers’ eyes. The green and yellow regions represent the images directed to the observer’s right and left eyes, respectively. Fig. 2 Mechanical design of novel microscope-integrated HUD system. (A) Photograph of the HUD and MIOCT system in use during surgery. (B) Photograph of HUD (white box in red border) mounted on a surgical microscope attached with a custom SSOCT sample arm (marked in yellow box). (C) Mechanical design of the HUD. (D) Photograph of 3D printed HUD prototype. Scale bars are 10mm. Fig. 3 Depth perception test. (A) Photograph of 25 gauge pinnacle forceps. (B) Photograph of the sample used in the study. (C) Sample image of OCT volume recorded through one of the microscope oculars during the study. Scale bar represents 1mm. Fig. 4 Images captured through oculars when (A) a grid chart was placed in the microscope surgical field without HUD mounted, (B) the grid chart was placed in the microscope surgical field with HUD mounted and (C) the grid chart image was displayed the HUD’s OLED micro display. Fig. 5 Depth perception pilot study results. (A) Success rate; (B) Average time spent in successfully transferring each bead; (C) Improved success rate in stereoscopic OCT vision; (D) Reduced time in stereoscopic OCT vision. Fig. 6 4D-MIOCT data displayed on HUD during a porcine eye operation. Images were captured with two cameras attached to the oculars of an assistant scope (Visualization 1). Fig. 7 4D-MIOCT stereoscopic volumes seen from different perspectives (Stereoscopic version: Visualization 2; Monoscopic version: Visualization 3). The white arrow points to the surgical forceps. The yellow arrow points to the internal limiting membrane (ILM). Fig. 8 4D-MIOCT stereoscopic images during human vitreoretinal surgery (Stereoscopic version: Visualization 4; Monoscopic version: Visualization 5). The surgeon used a surgical forceps to peel off the unwanted membrane. The white arrow points to the surgical forceps. The yellow arrow points to the internal limiting membrane (ILM). Fig. 9 4D-MIOCT stereoscopic images during human macular surgery (Stereoscopic version: Visualization 6; Monoscopic version: Visualization 7). The surgeon used a surgical loop to initiate retina. The white arrow points to the surgical loop. The yellow arrow points to a macular hole. Table 1 Comparison of resolution, FOV and distortion between microscope with HUD and without HUD. Comparison of resolution, FOV and distortion between microscope with HUD and without HUD.